Here are good news for travelers going from Clark to Virac or vice versa. Philippine Airlines will soon be operating direct flights on this new route. The move of PAL to open direct flight on the new route is expected to propel growth of tourism and economic activities in both the province of Catanduanes in which Virac is the capital and Pampanga, where the Clark International Airport is located. The new flight route will also answer the travel needs of passengers from Bicol region and Central Luzon. PAL flight operation between Clark and Virac will start on December 15, 2017. 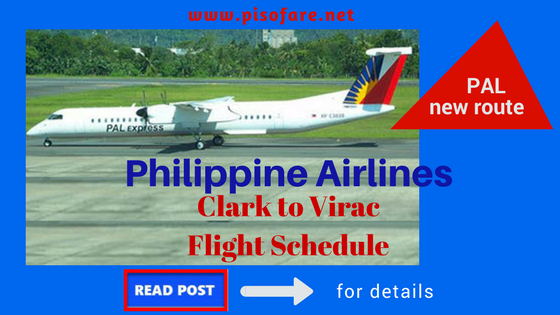 The Clark to Virac flight schedule is every Monday, Wednesday, Friday at 6AM and expected to arrive in Catanduanes at 7:30AM. PAL flight Virac to Clark will be at 8AM and anticipated time of arrival in Clark is 9:30AM. The airline company will be using the 76-seater Bombardier Q400 fleet for this new route. At present, online booking is not yet available for the Clark-Virac route. To check if you can make an advance reservation for the new travel route, you may contact Philippine Airlines Reservation numbers. For those from the places mentioned above, you can book your flight via Clark airport if you will be going to cities and areas near Clark instead of traveling via NAIA. This way you can avoid the heavy traffic in Metro Manila. Fly with Philippine Airlines to your desired destination and enjoy free baggage allowance: 7 kilos hand carry bag and 10 kilos checked baggage. Light snack is also offered on PAL domestic trips. Want to receive travel news and seat sale announcements? Then, LIKE us in Facebook: PISO FARE TICKET so you will be on the latest travel news & tips and promo fare tickets updates!